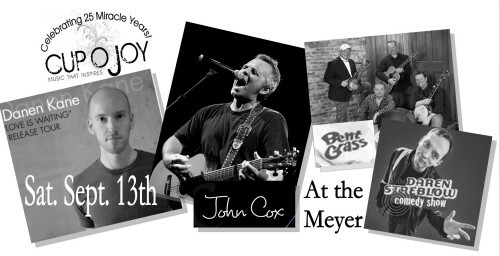 The Cup ‘O Joy, a very special regional music venue, will be celebrating their 25th anniversary on Saturday, September 13, 2014 at the historic Meyer Theatre in Green Bay, Wisconsin. This benefit concert will include a rare appearance by John Cox (who tours once a year to the Cup only), Danen Kane (see Kane’s recent reviews in past issues of The Phantom Tollbooth), the comedy of Daren Streblow, and the great musicianship of Bent Grass. While some music venues have sustained the test of time, few acting as a Christian ministry can claim this longevity. Imagine a concert venue offering over 100 concerts a year asking only a free will offering. All concerts are smoke free, alcohol free, family friendly, hosting everything from blues to gospel, mellow acoustic to hard rock. Now imagine this concert venue in its 25th consecutive year of operation in a moderately sized Midwestern city. Located on one of the oldest streets in of the oldest cities in America’s Midwest, the Cup ‘O Joy concert venue is found at 232 South Broadway Street in Green Bay, Wisconsin. Of humble beginnings, The Cup, as it is lovingly called today, began in September, 1989 housed in a rundown brick building of the late 1800’s which had served as a shoe store and a later a print shop. With the help of many volunteers and a good share of patience the Cup began to gain momentum.In 1999 The Cup moved to a new location, a former Salvation Army and Knights of Columbus building built in 1950, later converted to a tavern and eatery, a private club and then abandoned. Today the venue has state of the art sound, video, refreshment bar, entertainer’s lounge and kitchen, expansive library and various creature comforts. Over time, the Cup transitioned from a coffeehouse atmosphere to a concert venue. The first 5 to 7 years as an outreach saw the inclusion of music in the form of local talent. Then Eli performed as their first national act. John Cox, The Crossing and others began performing at the Cup. The list continued to grow with Super Chick, Sara Groves, Disciple, Building 429, Shawn McDonald, December Radio, JJ Heller and others. Today, major acts come to perform on the Cup stage, with every genre represented with music, comedy, and various art forms. Concerts are held Friday and Saturday nights, and admission is by free will offering only with one inexpensive benefit concert annually to help keep the lights on. Here, artists find they truly connect with the audience. The venue’s atmosphere lends itself to a close, one-on-one artist / audience relationship building a true channel of communication where both artist and audience share a mutual level of respect. Friendships thrive when the audience is physically next to the performer, seeing them live and sharing their art. The venue, the artists, and the audience owe a vote of thanks to the volunteers. The unpaid staff, from the manager to those providing meals for the artists, maintenance, and administration are each a blessing. Roughly 100 volunteers representing 35 different faiths and all walks of life serve in various capacities. Sustainability is made possible by the volunteers - people bringing their gifts to the table with a love to serve. The Cup is a ministry built with a greater focus than a small outreach. One that builds lasting relationships and true community. The focus is faith-based entertainment for all comers providing an opportunity to grow closer to God and community. Reaching out to all with a commonly understood mode of communication – the arts. In the spirit of love and faith, the Cup reaches this goal. These relationships continue to evolve between individuals, artists, and volunteers. Building faith and community remains the Cup’s focus for its 25th anniversary and on into the distant future. Join us at The Cup!